Because, hey, who doesn't enjoy a great cup of coffee to go along with a multibagger stock? On Feb. 17, 2006, The Motley Fool's David Gardner recommended buying Starbucks (NASDAQ:SBUX). David noted the company's omnipresent brand, impressive growth, and top-of-the-line financials, among other reasons. Investors that bought Starbucks on that day would have returned 225% on their investment as of the time of this writing, crushing the S&P 500 by 3.3 times over the same period (David has yet to recommend selling, by the way). I think that Starbucks remains a stock that investors should buy and never sell. Here are nine reasons why. At last count, nearly 19 million individuals have downloaded and use the Starbucks mobile app. As of the end of the company's fiscal second quarter, transactions done with the mobile order and pay feature of the app doubled year-over-year. Starbucks is processing eight million orders per month through this channel. Expect that number to keep growing. The app is convenient, easy-to-use, and increases customer loyalty. It's so impressive, that I covered it specifically in a previous article. The mobile app, and several of the other arguments below, describe new initiatives that are setting the table for Starbucks to grow in the future. The company is beating the competition to these platforms and dominating the digital experience. Looking forward, I think these strategies today will build a foundation that will continue to make Starbucks a lot more than just a coffee shop. The company's loyalty rewards program has succeeded right alongside its mobile app. There were 900,000 new customers signed up for the rewards program in the second quarter alone. Year-over-year, that's a 16% jump. As of March 31, there were 12 million members in the U.S. These members receive discounts, notifications, and the occasional free coffee just for shopping at Starbucks. There's nothing special or different about this. However, I think there's a deeper story here. I see this program as a catalyst for future growth. The program makes ordering at Starbucks convenient, simple, and digital. And, thanks to the way Starbucks has designed its loyalty rewards and app to handle mobile ordering, it has also created a huge stockpile of customer cash stewarded by Starbucks. When you sign up to use the company's mobile ordering and loyalty rewards program, Starbucks requires you to deposit a small amount of cash to be used for future purchases. Once that cash is exhausted, you can reload your account automatically in certain increments or do it manually. The key aspect of this process is that you are depositing cash into the account. As of March 31, the Wall Street Journal reported that Starbucks held over $1.2 billion in customer funds in these accounts. That's a tremendous amount of cash, more than many banks and financial services companies hold for consumers. By keeping customer accounts in their own coffers, the company can reduce transaction expenses (it's cheaper to pay a credit card transaction fee once for $20 rather than 10 times at $2 each), and it helps drive repeat business. There's essentially no friction in the ordering process. Holding customer cash within the loyalty rewards program is a key part of controlling that user experience, and making it as exceptional and easy as it is. At last count, there were 4,962 licensed stores plus 7,559 company owned stores in the U.S. alone. That's a lot of locations, with some intersections sporting two Starbucks stores literally across the street from each other. But that location density does not cannibalize business. Instead, it seems to stoke even greater customer demand. In the America's division, which includes Canada and Mexico, same-store sales were up 7% in the fiscal second quarter. And this growth is not out of the ordinary -- the company has been delivering for investors going back for years. Last quarter, Starbucks grew its revenue in China by 18%. From year-end 2014 to year-end 2015, the company opened 212 new company owned locations in the region. This growth comes as the world questions how much longer the country can continue its now decades long economic expansion. In total, there are just 1,811 Starbucks locations in the entirety of China. Over the next 10 years, the company could see explosive growth in the region, similar to its success blanketing the U.S. with green and white cups over the last 10 years. In 2015, Starbucks grew its licensed locations by 1,164 locations, adjusting out the impact of transferring its Japanese licensed stores into company ownership. That's robust 11% growth in just a single year. The franchise model should increase the company's cash flow and returns on capital. And just for context on how great the company is already doing, its return on equity on a trailing 12-month basis is currently over 44%. Remember, the story of the last ten years was growth in the U.S. and the beginning of international expansion. Over the next ten years, Starbucks will rely more and more on the global markets. Turning to a franchise model is a low capital, high cash flow strategy to do that. This is, in my view, yet another strategic building block for another decade of excellence. In the fiscal second quarter, the company's operating margins hit 17.3%, an all-time record for the company. Part of this is driven by the franchise model. Part of it is driven by a general uptick in business across the board. Globally, same-store sales were up 6% in the second quarter. Revenues jumped 9% to a quarterly record of $5 billion. Improved operating efficiency is the fundamental driver between higher cash flows, higher profits, and higher investment in growth. It's also a driver of increased dividends and additional share buybacks. On top of all this growth and reinvestment in the company, Starbucks still takes care of its shareholders. That's really important for a stock that you never plan to sell. The company's dividend yields 1.4%, and the board of directors authorized an additional 100 million shares for repurchase in the second quarter. 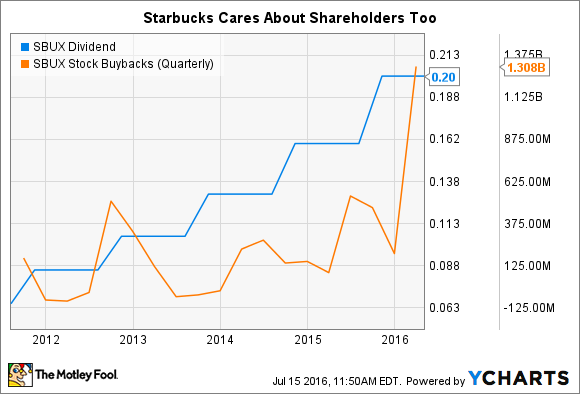 During that quarter, Starbucks repurchased 23 million shares. To me, that's pretty good, especially in context of the company's ambitious growth. Lastly, and perhaps most importantly, is Starbucks' growth. The company's stock is far from cheap. On a trailing 12-month basis, shares are priced at 34 times earnings, well above the S&P 500's currently elevated 25 times. To deserve this pricing, Starbucks must grow and grow quickly. In 2006, the story was similar. When David Gardner made his recommendation back then, the stock was at an even more expensive 44 times its forward earnings. David thought that the growth would continue, and it did. I think the company will prove to be a successful growth story again over the next 10 years. I've already mentioned the impressive growth in new locations, same-store sales, and franchise opportunities already achieved this year. The plans for the future are just as ambitious. This fiscal year, the company plans to open 1,800 new stores, net of closures. The plan is for 700 more in the America's region, 900 more in China/Asia, and 200 more in Europe, the Middle East, and Africa. About half of those stores will be franchised in the U.S., with about two-thirds franchised in China/Asia. The plan for the EMEA region is for more or less all the new stores to be franchised. There were just over 23,500 total Starbucks locations at last quarter end. If management succeeds with this growth plan, that would boost the total locations by about 8% this year. For an already established, global brand like Starbucks, this growth is amazing. For context, the company "only" had a little over 10,000 stores in 2006. And they plan to do this while maintaining above mid-single digit same-store sales growth globally. CEO Howard Schultz has said that he expects the company's revenue to surpass $30 billion by 2019. That's a huge jump from the $19.2 billion reported for last year. Ten years ago, it felt like Starbucks had already conquered the world. It turns out that there were still plenty of street corners, towns, and shopping centers capable of supporting a successful Starbucks location. Don't underestimate how many more promising locations remain today in the U.S., China, Europe, South America, Australia, Canada, Africa, and...well, you get the picture. The story of growth at Starbucks is, in my view, far from over.